In "Death for Double-O Neighbors", Tom Lucas owes plenty to Old Bob Hurley who raised him and helped him start up his own ranch, the Wagon Wheel. Lucas is also in love with his granddaughter, Marcia, who has just returned from the East. Hurley calls a meeting of all the small ranchers, for which Tom is a leader, to warn them a range war is headed their way if the skimming off of his yearlings doesn't stop. Lucas is torn by his loyalty to both Hurley and his Double-O Ranch on one side and to the small ranchers on the other. That loyalty is tested when his ranch is burned out and he and his partner are branded cattle thieves by Hurley himself. When Stanley Blanton, an engineer charting the mineral resources of the Northland, in the "Out Trail", crashes through a snow bridge with his sled and dogs, he injures his ankle. Two hundred and fifty miles from food and shelter for both himself and his dogs in the midst of a blizzard, all hope seems gone until a sled team appears in the distance. Knowing the code of the North - that one must to help another in distress - Blanton calls out, but the man and his team pass him by. Court martialed and losing the woman he loved seven years earlier, Cass Morgan, in "Powder for Santa Anna", has been living recklessly, shipping freight between the African coast and the Mexican gulf with his partner, O'Malley. As the war with Mexico, which Morgan is against, ramps up and the services of brigs are needed to move supplies and men to Taylor at the mouth of the Rio Grande, a web of deceit encircles Morgan as rumors of blockade running and smuggling contraband, including slaves, into Mexico tighten around him. 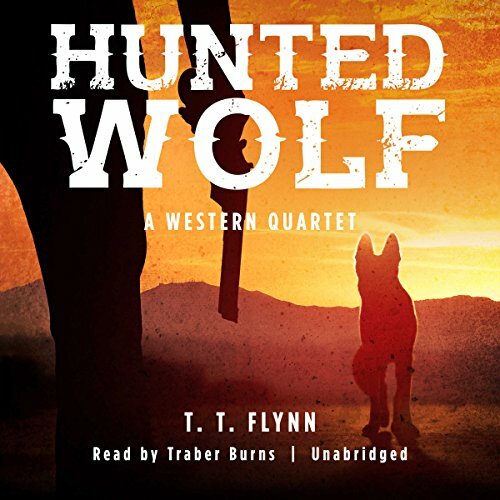 When Tom Buckner, in "Hunted Wolf", quits Hal Stafford's Cross-T Ranch, he didn't expect to be pursued and left to die in the desert, his horse wounded and a single cartridge in his gun. The appearance of a scrawny wolf at the dry basin provides a chance for survival - and revenge - if only Buckner can outwolf the wolf. ©2018 T. T. Flynn	(P)2018 Blackstone Audio, Inc.